"Employee time recording application you might be interested in"
The product presented here is called Employee Project Clock. 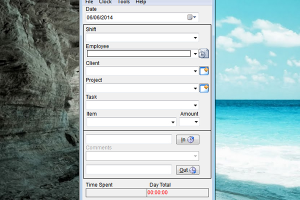 It’s a professional time recording software solution you might consider for entering employee time. If your company is looking for an application with such functionality you should continue reading on to find out more about its features. Employee Project Clock allows keeping track of multiple employees’ entry time on one or more computers. It’s an easy-to-use application with a clean and intuitive graphical interface enabling employees to quickly record their times. It also features support for breaking down the time by selection task, project or client optionally, and shifts are supported as well. Last but not least, it also encompasses administrative features for managing projects annex expenses, as well as creating custom reports. The latest version of Employee Project Clock at the time of writing even supports biometric fingerprint reading technology.